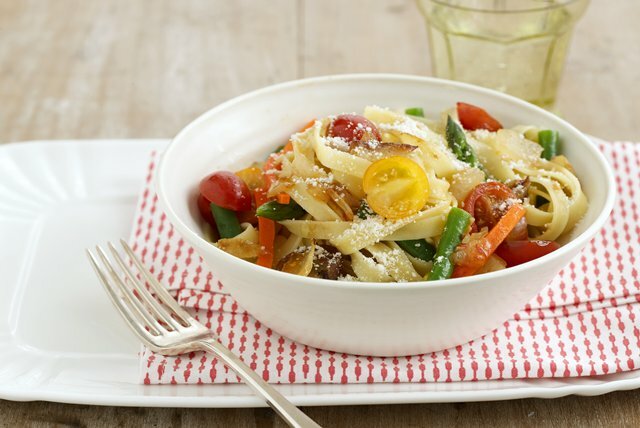 Primavera veggies—including green beans, asparagus and tomatoes—are tossed with pasta and topped with Parmesan in this winning weeknight dish. Cook pasta in large saucepan as directed on package, omitting salt and adding beans and carrots to the boiling water for the last 3 min., and adding asparagus for the last 2 min. Meanwhile, heat dressing in large skillet on medium-high heat. Add onions; cook 3 to 4 min. or until crisp-tender, stirring occasionally. Stir in broth; simmer on medium-low heat 5 to 6 min. or until slightly thickened. Add tomatoes; cook 2 to 3 min. or until heated through. Drain pasta mixture. Add to skillet; toss to coat. Top with cheese. Serve topped with 1/4 cup ATHENOS Traditional Crumbled Feta Cheese and/or chopped fresh basil leaves. Add 2 minced garlic cloves to dressing in skillet with the onions.